HomeFamous PeopleMy Psychic Reading for Ed Kavalee on Triple M’s Marto, Ed and Robin Show! As I wrote recently, announcer Robin Bailey was sacked from the 97.3FM Breakfast Show last year, in a controversial move by station management. I was on the phone, waiting to talk to her on-air about astrology at the time. Incredibly, the ratings for that quarter showed the Robin, Terry and Bob show had peaked at No.1 in Brisbane, after celebrating ten years on air. Talk about awkward timing. Fortunately, Robin was offered a spot straightaway at Triple M, and I was honoured to join her recently, for a ‘sceptics challenge’. Only two days before she contacted me, I said to my life coach Elissa Freeman, “I’m attracting lot of critics right now, I guess something good is coming – I’m being prepared for the next breakthrough”. Soon afterwards, I received a text from Robin. When she first asked if I’d read for her fellow announcer and sceptic, Ed Kavalee, I have to admit, I said ‘I don’t know’. Why? Because when I looked at Ed’s date of birth, he was a 35/8 Lifepath in numerology, the same as the world’s greatest anti-psychic, James Randi – see my article on why his million dollar challenge is ridiculous. I’d also heard him say to Robin ‘if you get a hot psychic I’ll do a n*de reading’, which was a bit confronting. I developed nausea just thinking about the show, as I have a history of being teased (see my thoughts on overcoming bullying). Plus, my fiance Kris and I are not only pregnant (with morning sickness), we have a one year old son, Forrest, are getting married in March, and do psychic readings in Brisbane (see Kris’s Tarot site). So we’re pretty flat out. Then again – Robin is one of the reasons I didn’t close in 2012. Not only is she uber high integrity, she’s helped me reach two million people online and through commercial radio. I love her dearly. I’ve also been reading The Science Delusion by Rupert Sheldrake (see his banned TEDx talk), which was recommended to me by an amazing philanthropist, as well as Strength to Love, Martin Luther King Jr.’s writings on dangerous altruism and the Good Samaritan. The first book has given me greater confidence in my psychic readings, as it documents evidence for consciousness and telepathy, in a scientific way. Dr King’s words have also inspired me to be more controversial, and less worried about my image. He said: “In a sense every day is judgment day, and we, through our deeds and words, our silence and speech, are constantly writing in the Book of Life. So, after a night studying Ed’s numerology, I rocked up to the Triple M studios nervous and excited. I figured that, even if I didn’t change Ed’s mind, I’d reach listeners who needed a fresh perspective on psychics. Like every industry, there are frauds out there, but I’m not one of them (see 75+ testimonials)! 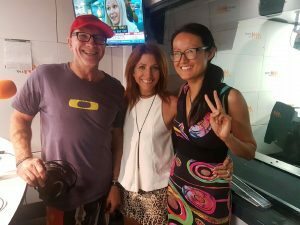 Robin: My friend and psychic Sarah Yip has come into the studio to do a reading for Ed, who is a non-believing sceptic – he calls it trickery and lies. Marto: Sarah I’m figuring most of your clients are females. How many of your clients are males wandering in for a reading of their future. Sarah: It might be 20%, which I believe is higher than for most psychics. I get a lot of partners, spouses, sons, I get a lot of families. Robin: Come on Sarah, let’s do this. Read Ed Kavalee, go for it. For a lot of people, that’s a change in the family life, home life, people living with you. Maybe even working with groups of people you’ve never touched the lives of before. Ed: Yes, I’m going to the river. I’m 37…first things first, you said 35 was a key age. I did get married (to Tiffiny Hall) at 35, that was the best day of my life. So it’s not too bad. Note: Ed also joined the Triple M Breakfast Show in 2014 after moving to Brisbane from Melbourne – that was a big year for him. I copped flak on Triple M’s facebook page, who said ‘anyone could have Googled that information on Ed’. My reply is – I didn’t choose Ed’s DOB, or make it add up to 35 – he already had that destiny before I read for him! Of course, my Spirit Guides gave me information that was known, to the Triple M audience – I’m not into invading people’s privacy on air. That does nothing for anyone’s reputation. Robin: Are you saying he’s going to have children or a family around then? Sarah: I think it’s a possibility but he could just have a really cute puppy. Sarah: I’ve heard that before. Ed: That’s interesting. I am married, my beautiful wife and I, a family, ok.
Marto: That’s all from numbers? You worked that out from numbers? Robin: Ed, there is a piece of information that Sarah got from your numbers, that I found fascinating. About you being a sceptic. Sarah: Well Ed, the reason you’re a sceptic is your sensitivity level is 11 out of 10. So you were probably shut down really early because you were so brutally honest. It’s really hard to parent blunt children. Sarah: It can be a parent’s nightmare. So by the age of 10 or 11 you probably learned how to speak in a way that gets more acceptance. The truth is, at heart, you’re a very honest, direct person. You prefer people who say it how it is, and you never forget what people have said to you. You really like when they keep promises. Note: Ed is missing a 2-5-8 in his date of birth, which gives him a line of sensitivity. In numerology, this means he takes years to trust people, and to enter and leave long-term relationships. It also suggests he likes to keep his feelings private, and is highly intuitive. Well, he is a well known improvisational comic. Funny people almost always have complex pasts. Off-air, Ed confirmed two significant challenges around 10, an age I described as a major turning point in a pre-recorded reading before we met. I said ‘that’s when your spiritual path was decided’. Sarah: You have the same numbers – almost 50% of the chart, it’s unbelievable. Marto: He’s looking for an out. Sarah: (Marto) is further along. Look into your future Ed. I like him, I’ve done his numbers. Marto: This is how you’re going to turn out! Ed: Oh no! Sarah I’m converted, I will change. I promise I will change. Thank you Sarah. This is the wake up call I needed. That’s good stuff. Marto: Are you still a sceptic? Ed: I’m sceptical, but at the same time, this is what people kept telling us Sarah and Robin – they’re sceptical, but then when they hear something that rings true, a little bit of that scepticism gets chipped away. Today a little bit of my scepticism has been chipped away, because there was some interesting stuff. Sarah: To be honest, I didn’t even know if I could read you Ed, but sceptics are the best. I’m a sceptic – a trained scientist, who worked for the United Nations. I did 2000 readings before I felt ok to charge for it (to clarify – I was paid, but I hugely doubted myself until I got to that milestone). I’m not a psychic by choice. I’m a psychic because it almost killed me not to be one. Ed: Wow. Was it all going through your head, and you had to get it out? Sarah: I did budgets for charities and I always knew how much we’d make – they ended up calling me the budget queen. One day I just realised I needed to use (my gift) instead of saying it was all logic. That was deceptive – not my truth. Robin: Ok, so in scale of one to ten, where are you sitting on the sceptical scale (Ed)? Ed/ Voiceover: Look, I’m still a 9, but I used to be, as Sarah says, an 11. I’ve come back down into the normal range. Sarah this is incredible, can you hang in there, I know you’ve done Marto’s numbers as well. I think we have to get to them. You’ve got Ed down to a 9 for God’s sake. Stay there. Marto, Ed and Robin, it’s the new Triple MMM. Robin: And says he’s gone from an 11 psychic, I mean sceptic, to a 9. With such a success rate, we asked Sarah to hang around so she could read Marto. Marto: She said I was like Ed! Marto: (Not) surprised by that. Keep talking. Sarah: Four of the last six PM’s in Australia were number 1’s. Ed: She’s spot on. This is great. Sarah: Your biggest challenge is, there’s so much stimulation in this world, where are you going to find your next thrill? Marto: For a bloke who talks weather, this is sounding pretty good! Note: Marto does more than he lets on – his ‘Marto’s Army’ has done some wonderful charity work, e.g. see this renovation of Nundah Cottages to help families with mental health issues. I believe he also owns a former military ute – many lifepath 1’s are known for their tough exterior and gentle interior. I should know, I’m marrying one (no pun intended)! Sarah: Both you and Ed, because you have the same birthday, are in a 9 – 1 Personal Year turning point in numerology (peaking June 2017). This is the biggest change in ten years, both of you have a wonderful positive peak in September, when Robin does too. Note: Ed Kavalee announced on 6/2/2017 (three days later) that he and Tiffiny Hall are expecting their first child. Congrats! Lucky Soul. A funny Dad and inspiring Mum – you’ll have a ball. Both Ed and Tiff are in Personal 9 Years of Conclusions, Healing and Rewriting History. As their birthdays are only weeks apart, they will always be in sync. Looks like their bub will arrive in time for their Personal 1 Years of Beginnings in June/ July 2017. My son did the same…see his 11:11 birth story. Tiff is a 31/4 Heart Healer lifepath, who is 32 years old. She and Ed are in their ‘life purpose’ peak periods (Tiff’s began at 31, Ed’s at 35). Many of my clients get married or have kids, around their lifepath ages. Maybe Ed needs to see my piece on psychic babies – I’m sure his kids will be ‘awake’. It’s hard to remain a cynic when your child talks about their past lives, or the Angels in the corner. Perhaps that’s the real reason I needed to read for Ed – to prepare him for a some fun times ahead as a conscious parent? Sceptics might wonder why I didn’t pick up Tiff’s pregnancy. Easy – because I wasn’t meant to. I can’t override a client’s free will – if Ed didn’t want me to spill the beans, his Soul could simply block me. I teach this in all my workshops. Even a baby can block a psychic from reading them, if they so wish. My son does it frequently! Sarah: In the Universe, September 2017 is a Universal 1 Month for every single person on the planet, for all six billion people. It’s also a really positive time in all three of your charts. I think there’s a reason you’ve been brought together. I don’t think anything is an accident… I 100% believe you guys will have a breakthrough in September. Find your 2017 Numerology Forecast. You’ve still got seven months to create it, so why don’t you write a wishlist and start putting it out there. You’ve got flow coming, you’ve got a tide coming, so go out fishing. Ed: Don’t say fishing Sarah. He’ll take it literally, we’ll be in a fishing boat. Ed: That’s not what we want. I love this, I’m feeling some flow. Robin: You are awesome Sarah, thank you so much. Marto: Why did you ask me and Ed to send you pictures of our hands? Sarah: In my typical sessions, they are 90 to 120 minutes. I’m telling you, you cannot BS a reading for two hours. You can do it for five minutes, but not two hours. Not with the types of clients I have (millionaires, Olympic athletes etc). They’re not stupid, they didn’t fall to the top of the pile. I wanted your palms to make sure I had the full picture, I wanted to make sure I wasn’t leading you up the garden path. Note: I sound a bit prickly here – forgive me, I was a bit sensitive about some of the facebook trolling I’d had the night before! Ed: Sarah it’s been an incredible pleasure, thanks so much for coming in. Sarah: I hope you enjoy the reading Ed. (I sent him a pre-recorded reading as a gift). Marto: Where do they find you? www.sarahyip.com, I’m always booked out at least two months in advance. Find me on facebook as The Numbers Queen. Ed: Sarah Yip, thank you so much. If you missed any of those readings, they will be on the Triple M website after this. Fascinating stuff Sarah! Well done. Thank you for the mention. It’s a pleasure to work with you.